Suitable for everyday use for indoors or outdoors in the garden. 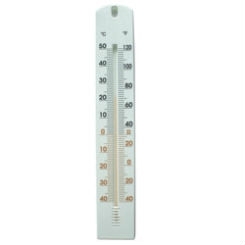 This thermometer displays in both Celsius and Fahrenheit scales and has a temperature range of -40ºC to 50ºC (-40ºF to 122ºF). Dimensions are 15¾"h x 2½"w.